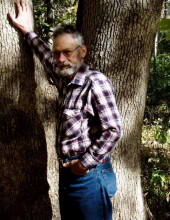 LEXINGTON- Earnest M. Carey, 58, of Lexington, passed away at 1:48 PM on Tuesday March 19, 2019 at his home in Lexington. Per his request cremation has been accorded and a private family service will be held at a later date. Calvert-Johnson & Musselman Memorial home in Lexington is in charge of arrangements. Ernest was born in Bloomington on February 10, 1961, a son to Morgan E. and Grace Hinthorn Carey. He married Tina Harrold in El Paso in 1987. She survives. Also surviving are his 2 sons, Aaron (Chrisa) Carey, Bloomington, Morgan Carey, Lexington; daughter, Tiffany (Robert) Runyan, Rantool; 4 grandchildren; 3 brothers; and 4 sisters. He was preceded in death by both of his parents; and 1 brother. Ernest was a binder at Taylor Communications for many years. He also enjoyed camping, NASCAR, riding his motorcycle, and the time he spent with his family, especially his grandchildren. "Email Address" would like to share the life celebration of Earnest Michael Carey. Click on the "link" to go to share a favorite memory or leave a condolence message for the family.